Chapter 2. Building a personal CD library. Chapter 3. Building a Pastebin. 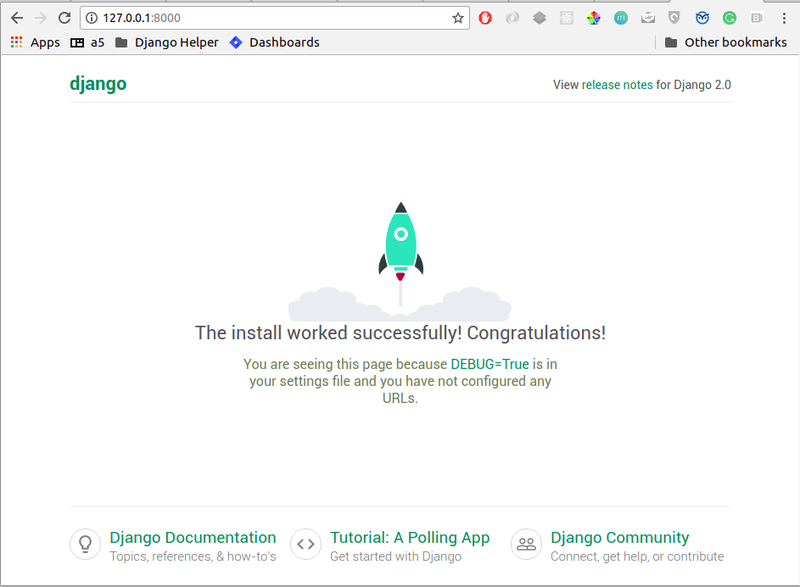 Now that we have installed django, we are ready to start our project. A project in django is analogous to a website. Once we have a project ready, we can host it using any wsgi supported server. More on deploying a django project later. django-admin.py is a project utility that ships with django. In addition to the startproject subcommand, it also includes a lot of helper subcommands that can be useful while maintaining a django project. Creates a Django project directory structure for the given project name in the current directory. __init__.py is an empty file required to recognize this project as a python module. manage.py is a script that is similar to django-admin.py which allows you to manage this project. It has subcommands to start a development server, interact with database, backup/restore data etc. Now open http://127.0.0.1:8000 in your browser. you will see django powered page. settings.py is a list of project wide settings with some default values. You will need to edit this often when installing new django applications, deployment etc. 'NAME': 'os.path.join(BASE_DIR, 'db.sqlite3')',      # Or path to database file if using sqlite3. 'NAME': 'djen_database',                      # Or path to database file if using sqlite3. 'USER': 'root',                      # Not used with sqlite3. 'PASSWORD': '****',                  # Not used with sqlite3. We will be using mysql database for examples in this book. Of course, you are free to change the settings to any other database you like. Just make sure the database exists. make sure the database given in the settings exists. It is advised to have a local_settings.py file with exclusively server specific and sensitive settings like database username/password, API keys or Secret Key etc and have settings.py import all these values. urls.py is a ‘table of contents’ of our project (or website). It includes a list of the paths that are to be processed and responded to. You are encouraged to go through settings.py and urls.py once to get an understanding of how settings and urls are defined. Now that we have setup and understood the structure of our project, we can start our application. __init__.py is again the file that allows this app to be considered a python module. models.py will hold the Models of our application. A model is an object of our interest which we want to save to the database. If you are familiar with Model-View-Controller(MVC) architecture, you know what models are. If no, don’t worry, we will see and use them in our application. views.py has all the ‘action’ of our website. This is similar to the Controller of MVC architecture. Each ‘view’ function takes a request object and returns a HttpResponse object. It is recommended to have another urls.py (like the one in project) in the app and include them in the project urls. This reduces the clutter in the project urls and provides a namespace kind of resolution between urls. Also, it makes it easier to redistribute the app to other projects. As you would expect, reusable apps will depend on the project as little as possible. We have used CharField, TextField and DateField in this model. Each CharField requires a max_length argument which specifies the maximum length of the characters that the field can hold. A TextField can contain any number of characters and is suitable for fields such as description, summary, content etc. DateField holds a date. If you need to store the time too, use DateTimeField instead. The genre field should be restricted to a group of values and that can be accomplished by passing an iterable of 2-tuples for the value and representation as the choices argument of the CharField. The __unicode__ property of the model defines it’s string representation which will be used in the Admin interface, shell etc. This lets django keep the database and your project in sync. Since we have added an app, django will create that app’s tables in the database. If an app is removed from the above list, django will ask you whether to remove the ‘stale’ tables. Also, make sure you have DATABASES settings correctly pointed to the database before syncing. Well, now that django knows about our app, let us add it to the Admin interface. The admin interface is itself a django app. It is flexible enough to accommodate any other app’s models and have admin actions for them. Note that the admin app uses a urls.py to keep its urls separate from the project (as discussed in the note above). 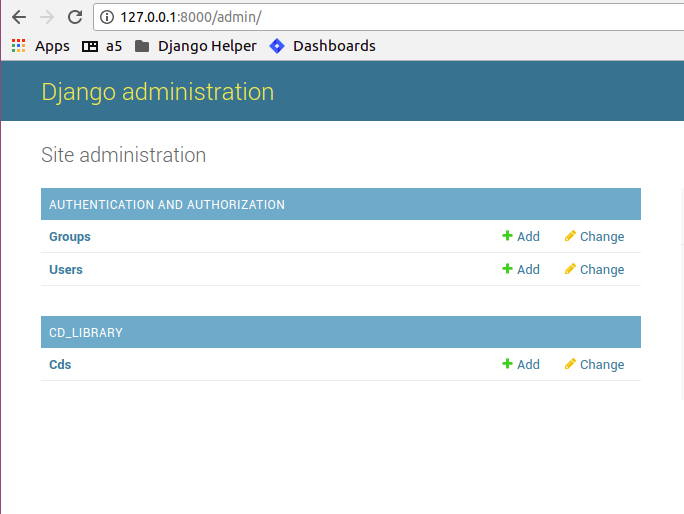 You should create a superuser, to login to django`s inbuild admin panel. Password:                       # password won't be visible for security reasons. Remember username and password for logging into the admin panel. Just to confirm it, you can open http://127.0.0.1:8000/admin/ in your browser. You should see ‘Site Administration’ and actions for ‘Authentication and Authorization’ which are enabled by default. So, we have ‘registered’ our CD model with the admin interface. If you refresh the admin page, you can see the ‘Cd_library’ header and ‘Cds’ under it. Yes this is our app’s model and we can add/edit/delete any instances of our CD model through the admin interface. Try adding a few entries using the Add action. You can edit entries using the Change action which will take you to the change list page. Try editing and deleting entries. With this, we have built our own personal CD library. Now, lets take a look at the raw data that django stores for us. We have configured the database django uses in ‘DATABASES’ attribute of settings.py. Notice that you can enter multiple database settings and use them by providing the --database switch to manage.py subcommands. Each table generally represents a model from an app. You can see that the CD model is saved as cd_library_cd table. Primary key field for an object (id in this case) is autogenerated by django. If you need a custom primary key, pass primary_key=True in the field. Django’s Object Relational Mapper (ORM) worked behind the scenes to create the tables, sync them with the models, and add/edit/delete entries to the tables. That is really the core of the work of the ORM: mapping classes (or models) to tables. While doing so, django takes care of the conversion of model fields to database columns, type conversions, primary keys, constraints and all of that. Thanks to the ORM, you don’t have to deal with the databases directly. In fact, if you were to switch the underlying database by modifying DATABASES in settings, your application would be least affected by it. objects refers to the default object manager. A manager provides the way of dealing with the database. Custom managers can be used to provide different ‘views’ of the model. More on that later. that is, a single instance of our CD model. The arguments must return a unique object or else this method will raise MultipleObjectsReturned error. Use the get method on when you want to retrieve one record based on the given criteria. How do we get all CDs of the year 2000? Use shell to experiment with object manager methods and lookups. © Copyright 2010-2018, Agiliq. Revision 53f0c353.